This post originally appeared on Frogloop. On Wednesday, Facebook rolled out a subscribe feature that should be of interest to nonprofits because it may make it easier for organizations to interact with people on a personal level. Most organizations have a branded page that Facebook users can like. When they like your organization’s page your updates appear in their news stream. But branded pages face a big hurdle: it is tough to connect at that personal level that helps define the Facebook experience. The subscribe feature opens the door to Facebook users being able to follow updates from people they don’t know without becoming friends. This means that your organization’s executive director, board president, communications director or on the ground leader can post to Facebook (hopefully with a personal voice) make those updates available to people they don’t know. Choose "Subscriptions" on the left side menu of your profile to manage subscribers and enable your subscription options. There are two parts to the subscribe process. First, you as a personal profile owner need to allow subscriptions. Click the subscriptions button on the left side of your profile page. You’ll then see the screen that allows you to permit subscribers. Click Allow Subscribers. Here you will also be able to manage who can comment on your posts seen by subscribers. Click "Allow Subscribers" to let people subscribe to your public posts on Facebook. If comments are “on” then any subscriber can comment. If comments are “off” then only friends of friends can comment. You can’t, however, turn comments off completely. You can also manage what notifications you receive about new subscribers. When you create a post choose "Public" to make it available to subscribers and friends. If you don't want an update available to subscribers be sure it isn't tagged as "Public." Subscribers will now see your public posts. Your posts are probably set by default to be seen only by friends. You can change this for specific posts using the dropdown button next to the Post button. How does one become a subscriber? Once you make public posts available for subscription anyone can subscribe. When Facebook users visit your page they will see a subscribe button at the top of the page next to the “Add Friend” button. If you’re already friends with someone you won’t see the subscribe button (because you’re already seeing their posts). Subscribe to a user's public posts by clicking the Subscribe button next to the Add Friend button. 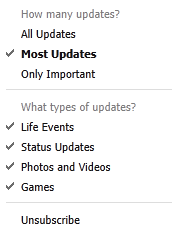 Choose which/how many updates to receive from users you are subcribing to on Facebook. A couple things to keep in mind: you don’t have to allow subscribers to your feed to subscribe to others and subscribers can control the amount and type of updates they see. The options for which updated you want to see as a subscriber are not very clear. Subscribers can see “all,” “most” or “only important” updates. Facebook needs to do a better job at explaining what this means in real terms. How will people know they can subscribe to your Facebook updates? 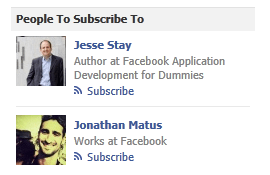 Facebook is actively suggesting people that you might want to subscribe to with ads in the right sidebar. An example of a Facebook subscription suggestion ad along the right side of the Facebook page. Some of these ads are filled with somewhat random people and others are people that your friends have subscribed to with the names of your friends shown. This, plus automated status updates when you turn on subscriptions and subscribe to someone’s updates should boost overall use of the subscribe feature. So who is going to use this and how can it help organizations? In the near term, subscriptions will be picked up by bloggers and others that pretty much do their work in and around social networks. Some of the early chatter about Facebook subscriptions is that it is a hat-tip to celebrity. Stars and people that are well known in social media and technology will probably get some added reach with this but, as Mashable notes, there are possibilities for journalists, parents and teachers, and even average users. There is an upside for nonprofits as well. Many organizations have leaders or staff with a personal brand on Facebook that is already being used on behalf of their organization and its work. An example would be Phil Radford, Executive Director of Greenpeace USA. Phil’s Facebook page shows that he has just under 2,300 friends, much of what he posts is only visible to friends but much of what he posts on Facebook is about Greenpeace and the issues on which the organization works. These posts are of interest to Phil’s friends but are not really directed at personal life events. But because they come from Phil (and not a huge organization on its branded Facebook page) they are a little more personal. A leader and/or strong social media voice for an organization’s cause could turn on subscriptions and post their work and issue-related updates publicly, making them available to the streams of bloggers, reporters, politicians, activists and countless other interested citizens. This provides a level of personal interaction around issues and the organization that just isn’t possible by following an organization itself. One potential downside: If you’re making your posts available to an audience of subscribers (and not just “friends”) then you make yourself more accessible. This is great in social media but increases the likelihood that you’ll be engaged by people that disagree with you. This is, of course, a primary concern organizations have with blogging and creating social media pages: what if someone disagrees with us and people see that? Facebook seems to have thought about this possibility and lets you manage who can comment (anyone that subscribes or just friends of friends). You can’t turn commenting off completely, however. It’s likely that Facebook will fiddle with the subscriber feature and we’ll see some fine-tuning of comments and subscribe process. Maybe it won’t get used much and will go away but that seems unlikely. This is a clear shot at Google+ type interactivity, for one thing.